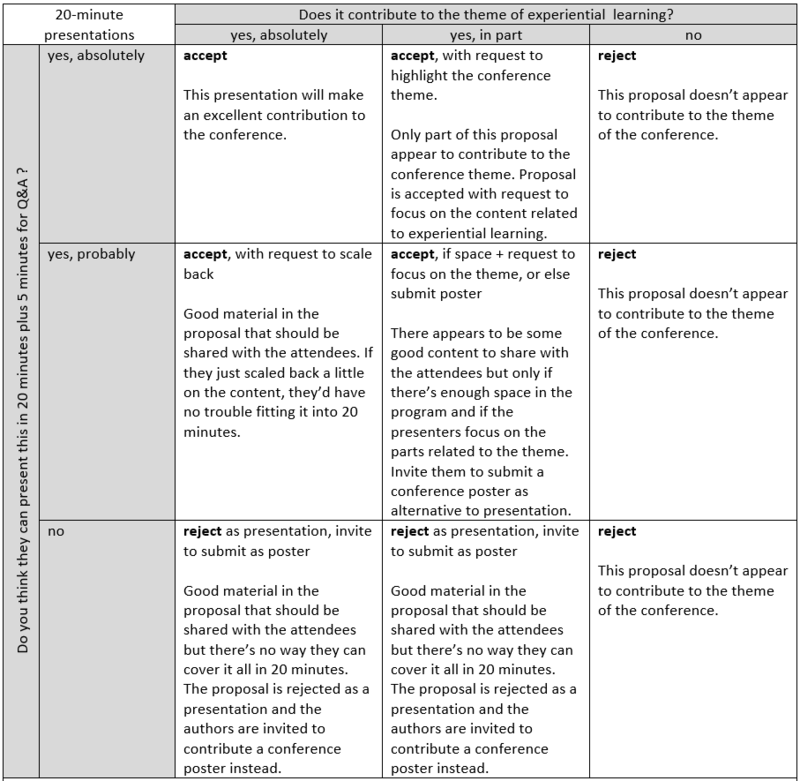 Giving a presentation, facilitating a workshop, and presenting a poster at the conference is an important opportunity for the presenter(s) and facilitator(s). Just as important, though, is the learning experience of the conference attendees. 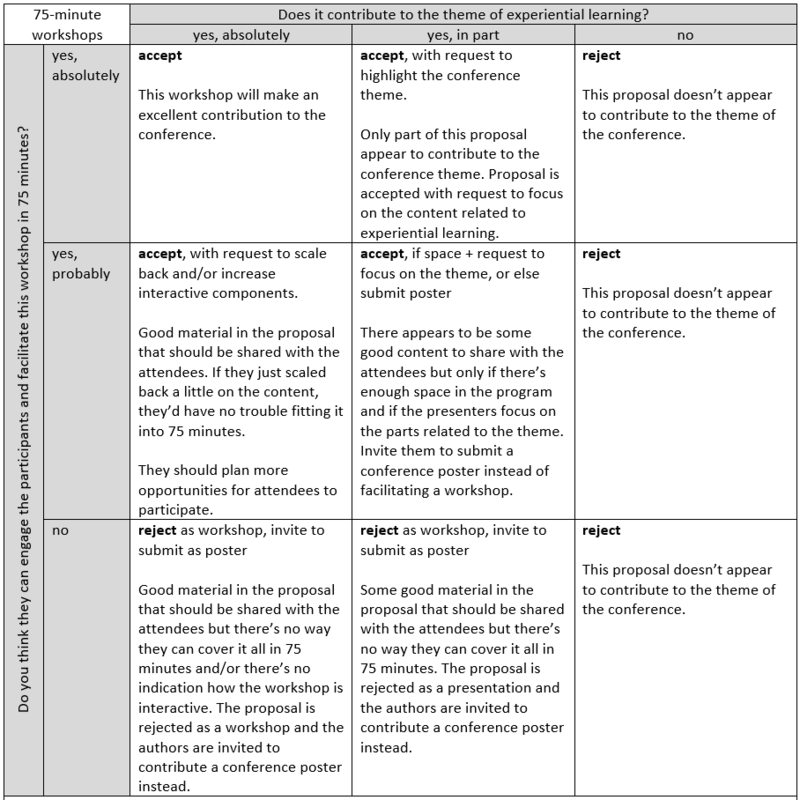 Therefore, proposals are evaluated on 2 dimensions: alignment with the conference theme and the attendees’ learning experience. 1. Does the presentation contribute to the theme of experiential learning? 2. Do you think they can present this in 20 minutes? 1. Does the workshop contribute to the theme of experiential learning? This workshop clearly aligns to the theme and will contribute to the knowledge and practices of the attendees. Some parts of this workshop contribute to the theme and for other parts, the alignment to the conference theme isn’t as clear. This workshop does not appear to align to the conference theme. 2. Do you think the presenters can engage the participants and facilitate this workshop in 75 minutes? The presenter(s) should be able to effectively engage the participants and facilitate their proposed workshop in 75-minutes. The workshop appears to cover a lot of material. It may be challenging to get through the material in an interactive and engaging way. There is too much content in this proposal to present in a 75-minute workshop. It is not clear the participants have opportunities to engage and interact. 1. Does the poster contribute to the theme of experiential learning? This poster clearly aligns to the theme and will contribute to the knowledge and practices of the attendees. Some parts of this poster contribute to the theme and for other parts, the alignment to the conference theme isn’t as clear. This poster does not appear to align to the conference theme. The Breakout Box … a portable problem-solving pedagogy package!